When I started the hoodies topic I thought for sure this was going to be one of the smaller posts. I guess I really didn’t realize how many hoodie options we had this year from Lululemon. I think the biggest news of the year was the replacement of the cult favourite Remix Hoodie with the new and improved Scuba Hoodie. 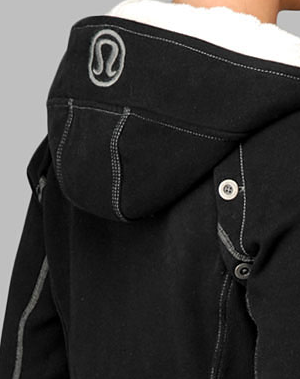 With change there is always bound to be some unhappiness with the people that loved the Remix ‘just the way it is’ but I think Lululemon did a great job in improving their main year round staple item. I find it’s a much better, more feminine fit that hugs your curves with the side ribbing panel and the longer length is way better. I found the old Remix to be quite stiff and inflexible and a tidge short on me but the new Scuba is a lot more flexible through the body without losing the thickness of the cotton fleece. A+ for the new Scubas and I’m looking forward to wearing my new Wish Blue one hiding under the Christmas tree. There were also some strange Special Edition Scuba Hoodies that were out this winter with removable sleeves, reversible cuffs/hood, lulu jacquard print and the Scuba that can be packed away into a pillow. Apparently these have been quite popular for the Hoodie collector but I just wasn’t into these deconstructed designs. I did like some of the rustic stitching on the Special Edition Scuba vest as well as the fuzzy hood but other then that I was not a fan of these Special Editions. I hope next year they make a plain scuba hoodie lined with the fuzzy material used in this special edition scuba. Another Favourite hoodie (although hoodless) this year was the Cuddle Up. I passed on it because I just didn’t see one that I was in love with. I did admire them from afar though and was momentarily tempted by the sparkle versions. My favourite of the lightweight hoodies was the Flashback Pullover. I ended up selling my beloved Flashback as it got too big on me. If this design comes back i’ll be sure to get a replacement for it as I found it really cute on over Wunder Unders as well as my jeans. I also liked the Free to Be Hoodies which came out at the same time as the Flashback Jackets. Another favourite lightweight hoodie has been the Wear With All which was out earlier this year, and currently replaced with the Live Simply Jacket. The Live simply jacket in Black/Black Lulujacquard Snowstar has been insanely popular for Christmas selling out everywhere. My least favourite hoodies this year (Disclaimer: don’t take offence if you loved them, they were just not my style) was the Effortless Hoodie and the Scuba Shaped Hoodie. These designs were just not happening for me and I wouldn’t even bring these home on steep markdown. Where you happy about the Scuba Replacing the Remix? What were your favourites this year and least favourite from this category? "Concern Over Reusable Shoppers Containing lead."